Open Source World provides so many options to choose from, for everything. If you are a music freak and looking for some Open Source music players for your Linux systems, you are at the right place. In this article, we have compiled 5 best open source music players, to fulfill all your needs. Lets get through the best music players for Linux systems and the steps to install them in your system. Audacious is an open-source cross platform music player which takes very less resources and gives you a good number of options. You can drag and drop folders and individual files to add to the running playlist, create and edit playlists and use equalizers according to your preference. You can even fetch the lyrics of a playing song for which the plugins are installed. yum install audacious-plugins-freeworld to install important plugins, most notably the MP3 decoder plugin. Here's the official website of Audacious http://audacious-media-player.org/ for more info. 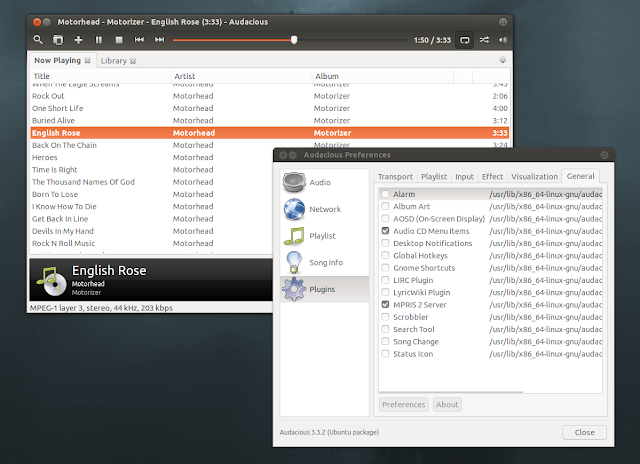 Clementine Music Player is another feature-rich music player for Linux systems. With an easy to use interface, it can help you search and play music in your system, create playlists, discover and download podcasts, even search and play songs uploaded to Box, DropBox, Google Drive and OneDrive, listen to internet radio from Spotify, SomaFM and others, and copy music to music players and iPod. You can install Clementine from the official repo, or use the below terminal commands to install it in Ubuntu. Amarok is a powerful cross platform music player and provides many exciting features. 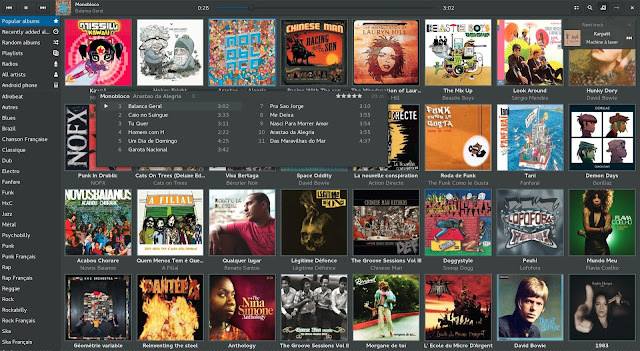 Amarok music player for Linux supporst drag and drop actions for songs, marking positions in tracks to listen from there later, creating dynamic playlists, multiple language translations, file tracking, playing audio CDs, and more. Amarok music player is available for a large number of Linux distributions like Ubuntu and derivatives, Debian, Fedora, openSuse, gentoo, arch Linux, mageia and FreeBSD. Lollypop is a nice music player that supports many audio formats. It has a party mode that lets the software decide the music for you. You can play music from web, create a playlist. get artists and tracks information from the web, and sync music with your android devices. Lollypop music player is available Ubuntu/Debian and derivatives, Arch Linux, FreeBSD, Fedora and OpenSUSE. VLC is one of the most used free and open source cross platform media player that plays almost everything. Play songs and videos stored in your hard-drive, from DVDs, CDs, pen drives etc. With so many choices, you can have a completely different open source music player for your Linux system. If you are using something that is not listed in above, let us know in the comment. I will try to include it in the above list.